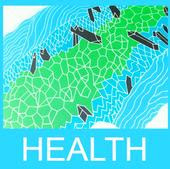 The long overdue HEALTH LP will see the light of day next month! This limited edition (500), hand screened ditty will hits stores officially on Dec. 4 2007. Just in time for the holidays! The band will have copies for their west coast tour in January 2008. You'll need to contact your local store and make sure they're on order or head out to one of the shows to obtain this first pressing. Love Pump United will have some as well. Thanks for your patience. Worth the wait! We've posted an MP3 from the LP, come on by and give a listen.